Found along the Western Cape, in the heart of the Whale Route, Hermanus is a beautiful and charming seaside village. At 100 km away from Cape Town, it takes only one and a half hours from the Mother City to reach there. Nestled at the base of the Olifantsberg Mountain that rises 958 metre above sea level, Hermanus overlooks Walker Bay - well-known for its world-class remarkable marine life. Due to its favourable coastal location, Hermanus is a popular holiday venue for weekends or even extended stays as it offers a multitude of activities and fascinates visitors throughout the year. Over the years, Hermanus has developed from a rustic fishing village to one of the 12 best whale watching destinations in the world. It is the perfect place in Cape Town where you can sit back, relax and admire the ocean titans as they cruise close to shore without a care. The annual visit of the whales is celebrated with The Whale Festival - a really impressive event! Apart from whale-watching, shark cage diving, the markets, the wine route, visitors to Hermanus have a variety of things to do to keep themselves entertain and make the most of this charming coastal village. Numerous visitors from near and far places flock to Hermanus to make the most of what this coastal village has to offer and to enjoy its many charms. 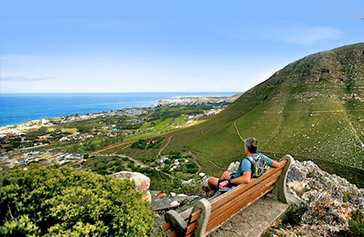 Along with magnificent scenic beauty, Hermanus has endless adventures to offer. 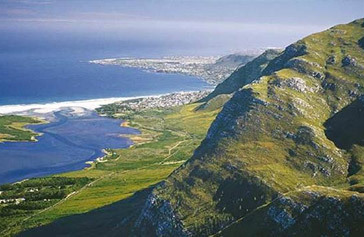 Below are the most popular attractions in Hermanus. Apart from these, boating, kayaking, kite-surfing, quad-biking and golfing are also famous in Hermanus. The major draw-card of Hermanus is, no doubt, whale-watching throughout the year. However, the best time to enjoy whale watching in Hermanus is between July and November. It is interesting to note that different types of whales can be spotted at different times of the year. 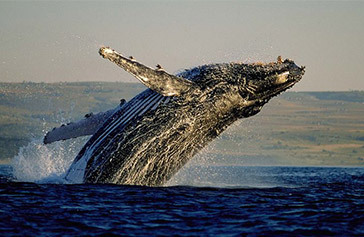 Also, whale watching has earned Hermanus the title of best destination in the world for land-based whale watching. So, visitors do not necessarily have to be on board to watch these magnificent creatures. They can be seen from the rocks, cliff-path, view points along the coastal roads and at some establishments, visitors can enjoy a view of the whales from the veranda itself. The majestic whales have always been a fascination for all. People travel from far-away distances in the hope of spotting one of these gentle creatures. It is indeed a life-time experience to watch the whales as they manoeuvre their tails to catch the prevailing wind and “sail” along in the water. They also love jumping clean out of the water (called breaching), to crash back down into the sea with a mighty splash. Fantastic sights! The cliff-path extends from one end of Hermanus to the other. As such, it offers 12 km of the best whale watching view points in the world. At some points, whales can be seen as close as 5 metres from the shore. Dreunkans is a popular whale-watching site. Drive south on Westcliff Road and park at Fick’s Pool. Take the cliff path towards the New Harbour for about 100 metres and you will reach Dreunkans. At the Old harbour, viewing terraces are available with spectacular views over Walker Bay. The Southern Right whale can be recognised by a calluses on its head. It also has a broad back without a dorsal fin and a long, arching mouth that begins above the eye. Southern Right whales often swim close to the shore. The Humpback whale has a remarkable body shape. It has long pectoral fins and a knobby head. Curious by nature, humpback whales will often approach boats to ”inspect” them by sunbathing near the boasts for a while. They are also known to “sing”, sometimes, for 10-20 minutes. Bryde’s whales are medium-sized, dark grey in colour and have a white underbelly. They can reach a depth of 300 m while diving and can stay under water up to 20 minutes. When Southern Right whales come to the waters of Hermanus to mate and calve, the Whale Crier alerts shore-based whale watchers about the whereabouts of whale. The Whale Crier blows a message, via a horn made of kelp. A sandwich board around his neck informs visitors how they may interpret codes. Shark cage diving is another popular activity in Hermanus. Shark cage diving is arguably one of the most thrilling experiences on the planet. Immense size, jet black eyes, rows of razor sharp teeth and extensible jaws - all these define the ultimate super predator. Get really close up to this impressive creature during your wondrous experience of shark cage diving! Shark Cage Dives are conducted from Gansbaai which is situated about 40 minutes outside Hermanus. Also, close to the southernmost tip of Africa, 8 km out to sea, lies Shark Alley - a favourite hunting ground of the Great White Shark. Shark Alley is a channel between Dyer Island and Geyser Rock and is protected from the worst of the southern Atlantic’s weather. Located about 5 km outside Hermanus, the Klein River is also known as the Hermanus Lagoon. It is 10 km in length and is surrounded by the beautiful Klein River Mountains and Walker Bay Nature Reserve. Besides, the area is home to nearly 130 bird species, including some of the rarest coastal breeding birds in Africa. Keen fishermen can often be seen in the area. The lagoon also offers breath-taking sunsets and a unique setting at full moon. This nature reserve in the Kleinriver Mountain above Hermanus is the perfect location for a leisurely hike. Along with the breath-taking hikes, a mountain bike trail and a short wheel chair accessible path, Fernkloof Nature Reserve is the habitat of many animals such as baboons and small bucks as well as over 92 species of birds. Guided walks are offered by request at a nominal fee. A visitor centre houses a weekly display of plants in flower and also provides general information and maps of the reserve. Another draw-card of Hermanus is the Hermanus Wine Route. The Hermanus Wine Route starts at Benguela Cove and goes up to the last stretch of Hermanus. Found along the Walker Bay Wine District’s famous R320, the Hermanus Wine Route meanders through the picturesque area known as the Hemel-en-Aarde Area. This wine route offers a variety of award-winning wines to taste at the numerous wineries which are all set in stunning scenery. Each grows small volumes of premium quality wine in well sustained vineyards. Moreover, the excellent restaurants at these wineries serve delicious meals that complement the wines.